This design is ONLY for Embroidery Billboard Gold Club Members. The design fits the 4x4 hoop and was donated by Doodle Mouse Designs . Please click the name to visit their site! 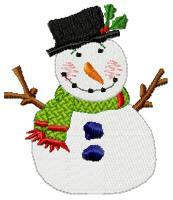 If you were an Embroidery Billboard Gold Club member on 12-1-2012 this design was emailed to you by attachment. Need to download the design again? Gold Club Members must CLICK HERE and use their Gold Club User Name and Password to download this design again. Email Pam at embroiderybillboard@cox.net if you need help or need your password resent to you. Not A Gold Club Member? Click The Payment Button Below To Join and be able to download hundreds of designs! After you place your order a Special GOLD CLUB User Name and Password will be emailed to you within 48 hours (or less). Thank you for supporting the Embroidery Billboard by being an Embroidery Billboard Gold Club Member. Designs and membership go together. The charge on your credit card or Paypal statement will show up as Adorable Affordable Designs. All major formats are included in the download.